Easter prompts many of us to reflect upon the suffering, injustice and great sacrifice of Jesus’ ministry and life. Suffering is a part of the human condition that none of us are immune to. The question I ask myself is, how am I responding to suffering with the love, grace and mercy of God through my life? One of the highlights of my recent trip to Congo was to meet the staff of both the clinics that Kent Covenant Church has sponsored in Gilinga and Nugaza. This photo is Jean-Piere Ndoy Wambe, Administrator for the Health Zone where these two clinics are. 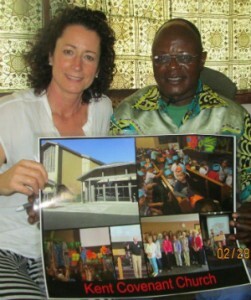 I gave Jean-Piere a poster as a greeting from our congregation for the Nugaza Clinic which is so remote I was not able to visit. Jean-Piere and Dr. Gigal, the Zone Physician, visit each clinic within the zone every other month. Their trip to the Nugaza clinic is quite an adventure, taking 3 days in total! They travel by motor cycle for 4 ½ hours to a river. They pile backpacks and boxes of supplies on top of their heads in order to cross the river. During rainy season the water is chest high! They then walk several miles to the clinic. After traveling so far in the heat and humidity, the rest of the first day is spent resting. The second day is a full day of work. Jean-Piere collects data on the clinic activities since his last visit such as number of births, deaths, and types of cases seen. This enables the leaders to see trends in the area and support appropriately. Dr. Gigal sees patients and families all day with the nurse of the clinic, and encourages the nursing staff in their care of the community. The third day is the travel home to Gemena. Much like our professions often take us away from our home and families, but our travel is so much easier to say the least! Dr. Gigal & Jean-Piere accompanied our team to the Gilinga Clinic. After driving for over an hour on bumpy roads and crossing several log bridges Dr. Gigal turned to me and said “I just want you to be prepared for the many people who are waiting to meet you, they are very excited!” There are few words to describe our greeting; joyful, exuberant, grateful and contemplative. I looked into each person’s eyes as we went through a greeting ritual, shaking hands, tapping heads together and saying “Mbote, Mbote!” (“hello” in Lingala) and I saw their love, hope and gratitude for our visit. They prepared a beautiful presentation of dance, and prayer. They told us how they used to go into the jungle to find medicinal plants but now they are grateful to have their own clinic with knowledgeable nurses and doctors. They are VERY excited to be connected to another church family. They actually said “Thank you for not forgetting us!” I was asked to speak and could not hold back my tears as I shared greetings from our church. It was an overwhelming and joyous experience! We sang, danced, ate and prayed together, it was heaven on earth for me! I am grateful for my partnership with Paul Carlson Partnership; as a Medical Ambassador serving on the Nursing Focus Group as well as a representative for Kent Covenant Church as we have embraced the opportunity to be a part of the Congo Clinic Initiative. So as we reflect on Holy Week, pray for our brothers and sisters in Congo who work hard just to travel about their land serving one another. They have few material resources but hold great hope for a better future as we work together. We can all rejoice, praising God that the power that rolled the stone away and resurrected Jesus from the dead is still the same power that is at work today in and through us. May we continue to love, serve and support each other in all our sufferings until we meet in glory. May God bless you as you share your gifts for the advancement of His Kingdom!